The ALG Defense Advanced Combat Trigger (ACT) is designed for those shooters where tradition, value and regulatory concerns are of primary importance. 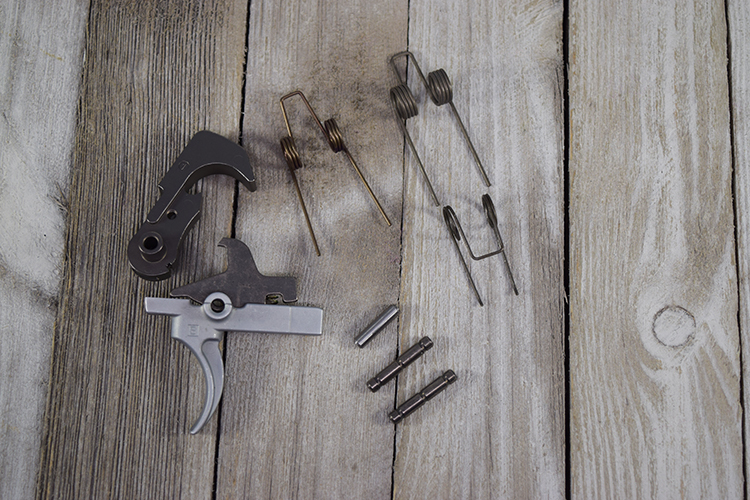 The pull of the ACT is very similar to a standard mil-spec trigger; however, it is sharper and the grittiness of the stock trigger pull has been removed while the traditional reliability of a stock trigger remains. The pull weight is not lower than the M4/M16 minimum weight specification of 5.5lbs. Note: HardLubing is ALG's term for electroless Nickel plating with an integral modifier to the base nickel plate. Either Boron or Teflon is used to enhance surface hardness, wear resistance and corrosion resistance and also create favorable tribological properties of the trigger components. Testing has shown that differential coating of the trigger parts contributes to the sharpness of the ACT's single stage pull. The trigger component is plated with Nickel-Boron which has a high surface hardness combined with excellent wear resistance. The color is a pleasing matte light grey that may be painted on non-functional surfaces if the shooter so desires (such as the trigger bow that is visible outside the lower receiver). The hammer, disconnector and trigger/hammer pins are plated with Nickel-Teflon which combines a low coefficient of friction with good wear resistance. The Teflon impregnation colors the metal a mottled, greyish/green. Parts coated with Nickel-Teflon cannot be painted. Both coatings are highly corrosion resistant eliminating the oil seal of traditional phosphated firearm components.